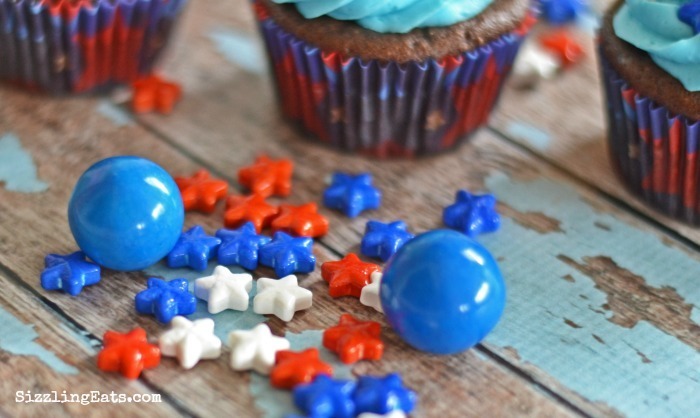 Celebrate the USA with Patriotic Star Chocolate Cupcakes! I really cannot believe that Memorial Day is already next weekend! Now that the warm weather is here, things are really starting to fly by! Pretty soon July 4th will be here too! The warmer weather has me wanting to be outdoors as much as possible. 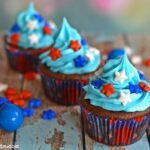 With the upcoming Patriotic holidays, I also have been having a blast making red, white, and blue treats. The folks at SweetWorks generously sent me a box loaded with fun red, white, and blue candies and foiled chocolates. Some were so pretty and dainty that I didn’t even want to eat them. I sorta just wanted to bottle them up and enjoy their shapes and colors. I don’t know about you, but there is just something so fun about making festive cupcakes using Celebration Sixlets, Star Candies, and Gum Balls. 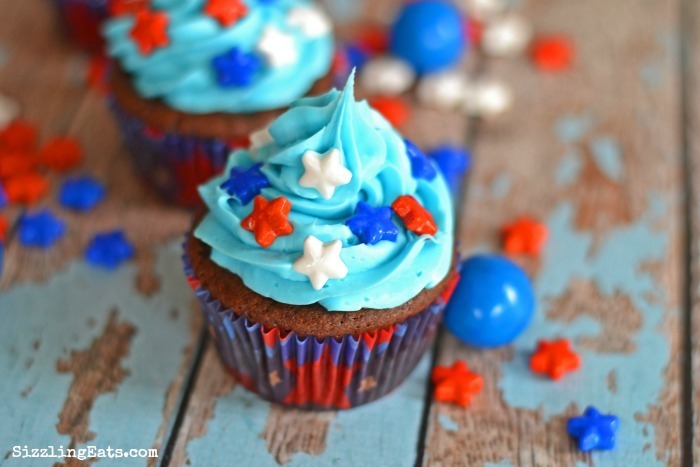 You have to admit that these Patriotic Star Chocolate Cupcakes look almost too pretty to eat huh? 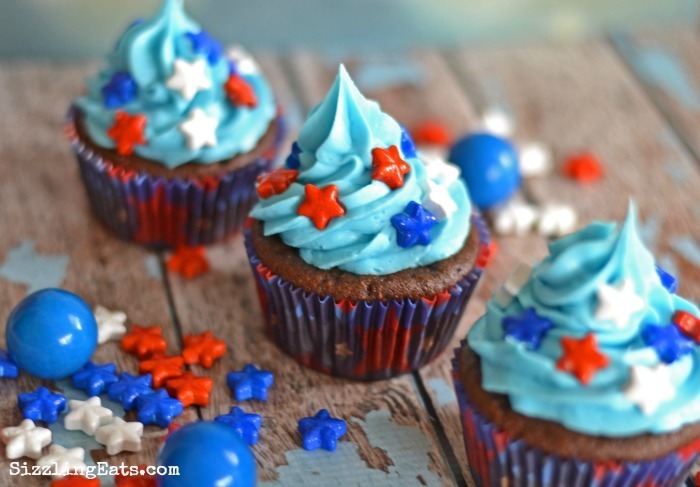 I just love the blue raspberry frosting paired with the Patriotic stars which are perfect for Memorial Day cookouts, Independence Day, Labor day–pretty much any day because we live in America! 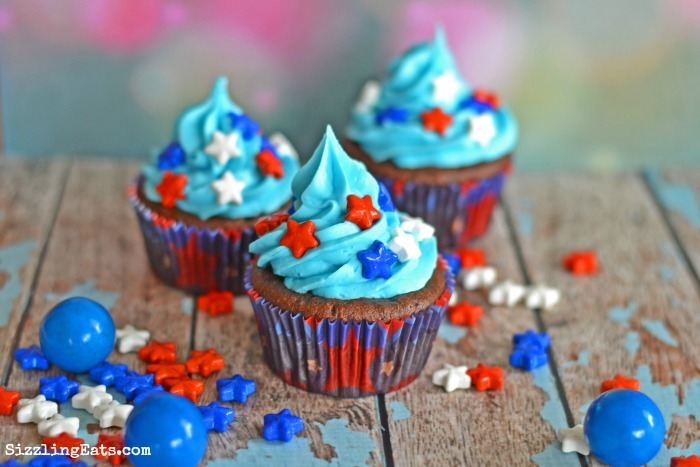 These Patriotic Star Chocolate Cupcakes are totally what I like to refer to as short cut cupcakes. I usually always make my own buttercream, but the Blue Raspberry Pillsbury Frosting really caught my eye at Target. I knew my kidddos would love it so I bought some, and made my own gluten free chocolate cupcakes. You could do a from scratch version or a box as well! 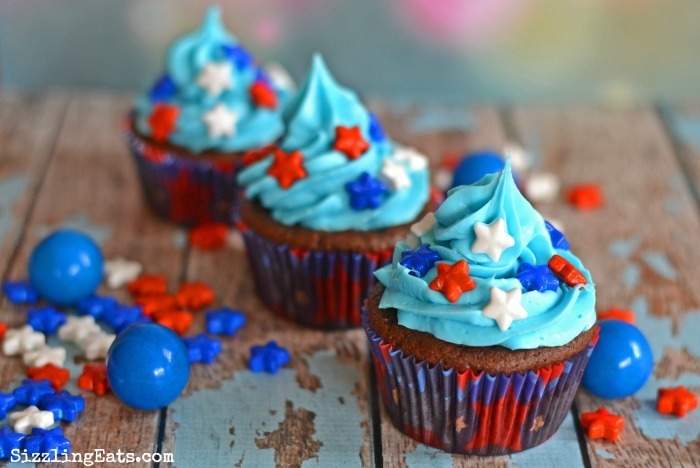 Adorable blue frosted cupcakes with red, white, and blue star candies. In a large stand mixer, cream your vanilla, butter, egg and sugar. In a separate bowl, combine all your dry ingredients. Slowly add your dry mixtures, milk and water to your mixer. Thoroughly mix for 2 minutes until full mixed. Fill each liner 2/3 of the way using an ice cream or batter scoop. Bake for 16 minutes, or until a toothpick comes out clean from the center of your cupcakes. Using a large Star tip, pipe on your frosting. Add Celebration by SweetWorks Red White and Blue Stars. They came out so cute and they’re perfect for Memorial Day this weekend. I am a BIG fan of cupcakes, especially chocolate ones. Cupcakes are one of my favorite desserts. Like cake, but portable…and how cute are these? Okay, seriously! How cute are these cupcakes? I am in love! They came out perfect and I bet they taste even better! Nom nom! I wonder how they would work with almond flour. These came out adorable! Very cute. I need to get better about baking with alternative flours. These are so colourful and cute – I bet this would be such a hit at any gathering! Cupcake love!! I love this idea!!! They are so cute! Soooo cute!!! Cant wait to make these! Very patriotic! My kids would love these, especially the toppings! Those are so pretty. Perfect for the holiday and a “sweet” way to pay tribute to our heroes! Those Patriotic candies are so awesome! They definitely completed those yummy cupcakes amazingly! I love them and such fun desserts for Memorial Day too! Oh I love them!! So pretty! These are so perfect for all the patriotic holidays coming up! Such a simple but cute idea! Love it! Those look gorgeous.My kids would love to have blue frosting mustaches! Those are super cute and so perfect for Memorial Day! Love them! This is such an awesome treat! Thanks so much for the post!